When it comes an outdoor kitchen, a high quality outdoor refrigerator is simply par for the course. They offer a convenient way to chill beverages, food and snacks for a perfect backyard experience. Not only that, but with stainless steel exteriors and energy efficient designs, they add visual appeal and won’t break the bank. Whether you’re planning a massive BBQ or simply enjoying a beer after work, an outdoor refrigerator makes for a great choice. Throughout the creation of this article, we’ve spent hours researching, comparing and ranking the best outdoor refrigerators on the market. Our goal is to ensure you get a durable outdoor rated unit that will perform year after year for dependable and reliable outdoor enjoyment. 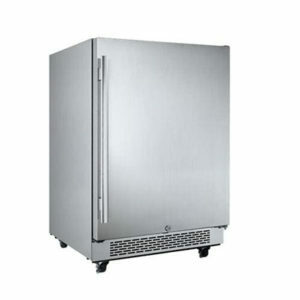 The Summit SPR627OS is a high quality, professional grade outdoor refrigerator and simply put, the best in its class. 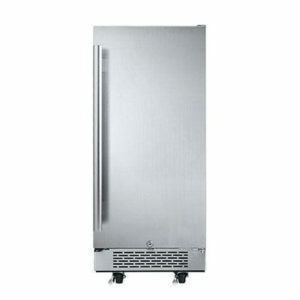 It offers superior stainless steel construction, a powerful compression cooling unit and intuitive digital controls. You’ll also find its massive 4.9 cubic foot interior and adjustable shelving perfect for drinks, food and more. Plus, it’s fully UL and CEE Tier II certified for extended outdoor use and low energy consumption. With a fully seal door, enclosed electrical connections and robust components, this is an excellent addition to any outdoor kitchen and will soon be your favorite outdoor appliance. If you’re dead set on a purpose built freestanding outdoor refrigerator, the Fire Magic 3590-dr is the way to go. You’ll find it has a reduced price tag, yet can still go toe to toe with the best built-in models. It features an insulated stainless steel door, adjustable glass shelving and stunning internal LED lighting for a high class look. Not only that, but with 4.2 cubic feet of space it offer generous cold storage for your outdoor events. 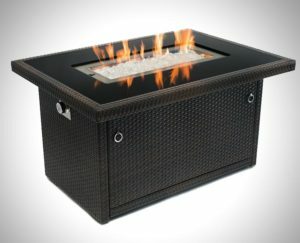 As a low cost, yet high powered option this is a great choice and is an amazing upgrade for your backyard patio. At its core any refrigerator is fairly easy to understand. 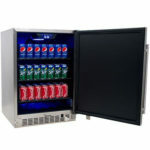 It uses chilled air inside an insulated chamber to keep your food and drinks cold. However, when it comes to an outdoor refrigerator, there are a few factors to be aware of. These can range from configuration choices and materials to industry terminology and estimated costs. In this section we’ll cover the in’s and out’s of choosing the right outdoor refrigerator. After all, appliance selection is a critical step when planning or upgrading your outdoor kitchen. While they may serve the same function, outdoor and indoor refrigerators are two totally different appliances. Inside your house, you’ll typically have a climate controlled environment. This means stable temperatures, regulated humidity and limited dust. Outdoors, the ambient temperature has a wide range and changing humidity levels in conjunction with harsh weather pose a constant threat. As such, outdoor refrigerators need to be built with these factors in mind to mitigate any adverse conditions. The first thing you’ll notice about an outdoor fridge is just how thick and heavy they are. Because of the varying outdoor temperatures, they need to have an increased amount of insulation to compensate. This added protection provides a barrier which helps keep the inside cold regardless of the weather. Plus, it reduces power requirements as a smaller motor and compressor can be used in lieu of a larger model. Without the added insulation you’d need a much bigger motor to keep the unit cool in the summer, this would not only be expensive, but also very loud. As an example, try putting a typical $180 mini fridge outside in the summer and you’ll see what we mean. It’ll have trouble keeping the interior temperature lower than 55 degrees. And even if it managed that, you’d also see large temperature swings back and forth, perfect for bacteria and mold growth. Don’t use a cheap interior mini fridge as an outside refrigerator substitute. Another complication that exterior refrigerators take into account are adverse weather conditions. From summer showers to blowing sand, extra protection is needed to prevent malfunctions and ensure reliability. A good outdoor kitchen will have a refrigerator equipped with multiple forms of weather proofing such as door seals, elevated construction and corrosion resistant materials. When combined, these reduce or eliminate the hazards associated with water and debris entering your fridge. Plus, they typically offer an enhanced outdoor lifespan and reduce necessary maintenance. If your unsure as to whether or not a refrigerator is outdoor rated, look for a UL approval stamp. The Underwriters Laboratories stamp is is given only to units that pass a multitude of outdoor tests. These range from leak testing, outdoor performance, and safety trials to prove a unit is safe to use in wet, outdoor conditions. Without this stamp, you can be pretty sure a non-rated fridge will fail in a matter of months. Ensure your outdoor refrigerator has a UL certification stamp. Have you ever looked on your patio and noticed the dirt and debris that piles up in the corners? That stuff is pretty much a death omen for a regular refrigerator motor. Without the necessary filters and sealed bearings, dust will quickly cause an unprotected unit to clog up and fail. Even small things such as hinges need to be seal or else they’ll begin to stick and seize shut. Robust components, while more reliable, are also more expensive. 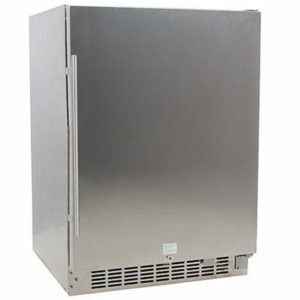 They are a necessary part of any top rated outdoor refrigerator and are not found on many of the cheaper interior models. Even more, with quality parts you can expect a lot less maintenance and hassle, something no homeowner wants to deal with. Interior refrigerators aren’t built to withstand moisture, dust and debris, outdoor models are. Outdoor refrigerators comes in either built-in or freestanding models. Each provide the same outdoor performance and quality but require slightly different setups. In most cases, you’ll be looking for a built-in model. These are placed snugly under the counter and require no air gaps. This is due to their front venting design which allows for full air circulation and cooling without rear or side fans. Freestanding models, if installed under a counter, required at least a 1″ gap on all sides to allow for adequate ventilation. Not only does this look unrefined, it’ll quickly break up the look of a seamless outdoor kitchen. Most outdoor refrigerators are front vented, built-in units. If you’re planning to have the outdoor refrigerator located on the side of your cabinets, either model will work perfectly. However, you’ll also want to take into account electricity requirements. A typical unit will need a dedicated 110V GFCI equipped outdoor outlet for power. Depending on the fridge placement, you might need to have an outlet installed or use an extension cord. Built in units will usually require a custom outlet install in your outdoor kitchen. Freestanding units on the other hand can be placed nearly anywhere that is convenient and you might get away without having to spend extra money. In general though, a built-in outdoor refrigerator can function as a freestanding unit, but not the other way around. 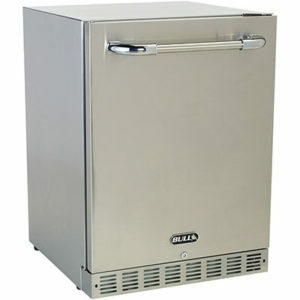 The overall size and capacity an outdoor refrigerator are both important factors to consider. The market is divided into normal and compact sized units. A normal unit typically runs a 34″ tall, 24″ wide and 24″ deep. They have storage capacities in the range of 5.5-6 cu. ft. depending on insulation and wall thickness. A normal sized unit is what you’ll find in most outdoor kitchens. They are large enough to hold raw ingredients as well as keep quite a few drinks ice cold. Compact units are a bit on the smaller side and typically provide right around 3.3 cu. ft. of space. They also have similar measurements, but are about 38% slimmer. An average slim fit outdoor refrigerator will measure in at 34″ tall, 15″ wide and 24″ deep. These are great if you want outdoor refrigeration but have a limited budget or a lack of available space. You’ll also notice that both the compact and normal models have the same height and depth. This is because they are counter top depth units, making them a perfect fit for most outdoor kitchens. With a few set dimensions it’ll take the guesswork out of cutting the right sized holes and make the process much easier. Each model will also come with a cut sheet that you can use to precisely locate your cutout. As with most appliances, whether indoors or out, the cost can vary widely between models. Most outdoor refrigerators in the 3-6 cu. ft. range will cost between $500 and $2000 depending on the brand and materials. You’ll likely find a few models that are in the sub-$300 price range as well. We’d highly recommend you avoid these as they are most certainly not UL rated and are primarily designed for indoor use. Plus, if you use one outdoors, there is a good chance you’ll immediately void the warranty and almost assuredly experience premature failure. Tip: Keep your outdoor refrigerator away from heat sources such as propane burners and grill smoker combos for increased efficiency and lifespan. You can expect your new outdoor refrigerator to last around 5-10 years with minimal maintenance. Some will last much longer and a few of the cheaper options may be on the shorter end of the scale. Electricity wise you’ll be spending $35/yr on average to run one. However that number can quickly change depending on the ambient temperature, humidity and location. Overall, a good outdoor refrigerator should start right around $750 and once installed will be fairly cheap when considering the cost of an entire outdoor kitchen. If you’re considering purchasing a quality outdoor refrigerator, make sure it’s made from 304 stainless steel. You’ll also find it labeled as 18/10 or 18/8 stainless steel. Due to its high chromium content of around 18%-20%, it is extremely resistant to rusting. This is absolutely necessary for a wet, humid outdoor environment. Lesser quality materials will frequently rust out and become easily damaged, seal incorrectly or outright fail. Even if you think you’re in a dry area, there is always water moisture in the air and it will affect your outdoor appliance. While we didn’t recommend any on this list, you can also find outdoor refrigerators with plastic exteriors. These are quite resilient to humidity and help to prevent mold and bacteria growth. However, they are much easier to damage and a susceptible to becoming brittle after extended UV exposure. In general, unless you’re on an extreme budget, we’d recommend you select a 304 stainless steel option. While all of these are purely optional, it’s a good idea to know whats out there. Of all the high end options listed, our favorites are the adjustable thermostat and the door locks. These provide a tangible benefit and are well worth the money. However, if your selection doesn’t have these, it’s definitely not a deal breaker. We’d also like to mention the interior fan. It comes standard on many models and provides much need air circulation. The moving air helps to reduce condensation, prevent mold growth and is overall an excellent feature. As with any outdoor appliance, you can expect a bit of extra maintenance when compared to an interior model. One of the things you should really remember though is that outdoor refrigerators are not designed for temperatures below 40 degrees. Similar to how you don’t run your car’s AC in the winter, you won’t want to run your fridge either. Once the outdoor kitchen season is over, it’s a good idea to empty the unit’s contents and unplug it from the wall. In addition, you’ll want to prop the door open slightly to promote airflow and inhibit the growth of mold and bacteria. If you’ve opted for a freestanding unit, you might also want to consider covering it up. However, keep the cover quite loose as you don’t want to have any moisture get trapped and damage electrical components. Speaking of moisture, on a semi-regular basis you’ll want to check your outdoor refrigerator for condensation. If you see any, simply wipe it off with a dry cloth. This can occur in either summer or winter so you’ll have to keep a watchful eye out for it. However, aside from the above items, there isn’t much else that goes into keeping your outdoor refrigerator in tip top shape. As we’ve mentioned earlier, if you’re after an outdoor refrigerator, chances are you’ll be looking mostly at built-in units. These compact systems are designed to fit under a counter top and are built to need zero side and top ventilation. As such they are typically the best choices for outdoor kitchens. This list covers eight of the best 3-6 cu. ft. models that are both full sized and slim fit. 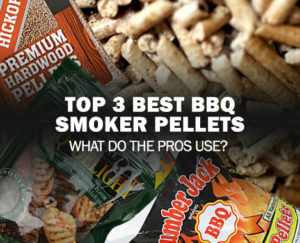 We’ve rated them from our best pick to simply great, so you can easily choose the right model. If you’re after a purpose built freestanding unit, skip to the next section instead. Cubic Feet: 4.9 cu. ft.
As our #1 pick for the best outdoor refrigerator, the Summit SPR627OS is the perfect blend of modern technology and stylish looks. With a professional stainless steel door and robust internals, it’s specifically designed for extended outdoor use. Plus, at 24″ wide and 34″ tall, it’ll fit perfectly under an outdoor kitchen counter. 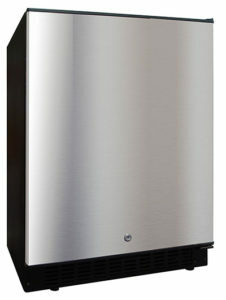 Furthermore, this unit is CEE Tier II qualified and uses up to 25% less energy than typical outdoor refrigerators. Once opened, recessed LED lighting creates an elegant glow and allows you to easily locate drinks and snacks. Meanwhile, the insulated door includes a security lock to prevent after hour thieves or sneaky party goers from stealing a beer. You’ll also find a dedicated electronic control panel located in the unit interior. This digital thermostat can be used to quickly control the temperature with a push of a button. Even in 100 degrees or more, the Summit SPR627OS Outdoor Refrigerator can get down to a chilly 36 degrees. This’ll keep your beverages ice cold and make for great summer BBQs. 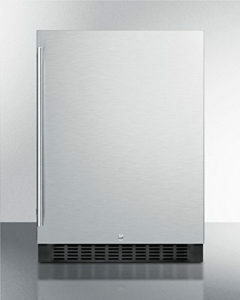 Related: Grab the Summit SPR627OS2D, a matching outdoor ice maker. Inside the fridge you’ll find three adjustable glass shelves that can be organized for bottles, cans and condiments. Each shelf measures in at 18″ wide and 16″ deep giving you a wealth of storage space. Overall, the Summit SPR627OS has 4.9 cu. ft. of capacity making it perfect for a multitude of drinks and larger parties. You’ll also have the option of picking up additional door shelves for even more storage potential. An internal fan provides even cooling throughout the unit through the use of forced air circulation. This has the added benefit of reducing condensation and providing energy saving potential. Similar to most outdoor refrigerators, the Summit has an environmentally sealed back with no exposed electrical components. This increases resistance to the elements and prevents shorts and corrosion. We were please to see it was also Energy Star certified for residential use and has the low operating cost to back it up. In summary, if you’re looking for a high performance, top quality outdoor refrigerator, the Summit SPR627OS would make for an excellent choice. Cubic Feet: 5.5 cu. ft. The Avallon AFR241SSODRH Outdoor Refrigerator is a stunning example of design engineering done right. Fully encased in stainless steel, this thing looks stylish and refined. Unlike other models which are only partially stainless steel, the Avallon looks just as good freestanding as it does built in. Even the front vent and solid handlebar are top quality and ooze sleek, functional appeal. Inside you’ll also find a host of features such as internal LED lighting, forced air dispersion fan and a digital control panel. If you’re someone who likes to dial in settings just right, you’ll really appreciate the granular controls. 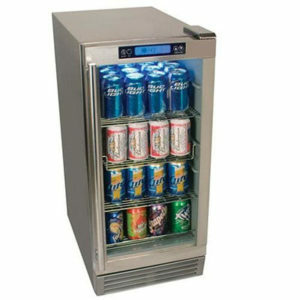 Plus, this unit has the ability to get down to a chilly 34 degrees for frosty beers and super cooled drinks. Three included frosted glass shelves as well as door shelves round out the interior and provide fully adjustable storage spaces. Even more, the inside is a whopping 5.5 cubic feet making suitable for outdoor kitchens of all sizes. Related: This unit is available in either left or right hinged models depending on your preference. When it comes to components, the Avallon AFR241SSODRH is made only with the best. It’s got a front vented compressor system for high performance cooling in all temperatures. On the rear of the unit an activated carbon filter helps to reduce mineral buildup and odors to keep your fridge running like new. Furthermore an anti-vibration gasket dampens motor movements to keep your drinks unshaken and undisturbed. Finally you’ll receive a set of optional casters that you can install for easy movement if used as a freestanding outdoor refrigerator. Overall this built-in outdoor refrigerator is an elegant, stylish and functional outdoor kitchen appliance. With adjustable temperature ranges, high end material and a 5 year limited warranty there is little reason to choose anything else. Plus, it’s fully certified for outdoor use and can withstand even the harshest of summer storms with ease. Simply put, the Avallone AFR241SSODRH is a top notch outdoor refrigerator and we can 100% recommend it. Cubic Feet: 3.3 cu. ft. The Avallon AFR151SSODRH is a 3.3 cubic foot, high end outdoor refrigerator with a wealth of features. Due to its slim profile design and fully enclosed stainless steel body, the Avallon is ideal for either a freestanding or built-in outdoor fridge. If you’re struggling to fit in every appliance in a compact outdoor kitchen, small units like this are truly a godsend. Even better, they are significantly cheaper than larger alternatives. A state of the art compressor allows for reliable cooling on even the hottest of summer days. Meanwhile, the digital touch control panel lets you choose a customized internal temperature between 34 and 50 degrees. You’ll find that a lot of cheaper outdoor refrigerators have trouble getting down into the 30’s. This unit has no trouble getting there and staying cool for months on end. It also comes with an internal fan to help regulate cooling throughout the fridge. This not only reduces condensation, but also provides even cooling for the entire interior. The three provided frosted glass shelves can be placed in six different positions. Whether you like beer, wine or juices, you’ll be able to customize the shelving for the perfect fit. While it won’t hold as much as a 5.5 or 6 cubic foot model, it’s significantly more compact and perfect for smaller outdoor kitchens. Plus, the included carbon filters reduced harmful odors and keeps the Avallon AFR151SSOD smelling clean and fresh. The modern stainless steel exterior easily transitions into the luxury interior with the aid of integrated LED lighting. With optional blue or white LEDs you can tailor the look of your fridge and make it a true luxury appliance. Even more, the built-in door shelving give you that little bit of extra space for easy to grab drinks and commonly used items. A security door lock is also installed to keep children from opening the fridge and stop guests from sneaking an extra beer. Overall, this is a spectacular outdoor refrigerator. It’s got the space, looks and performance for years of BBQ’s, parties and more. Not only that, but as a compact unit, it’s much easier to position and is very budget friendly. If you’re looking for a slim outdoor refrigerator, the Avallon AFR151SSOD will make a wonderful addition to any outdoor kitchen. Cubic Feet: 5.6 cu. ft. The Bull 13700 premium outdoor rated stainless steel refrigerator offers superior performance and one of the best build qualities on the market. 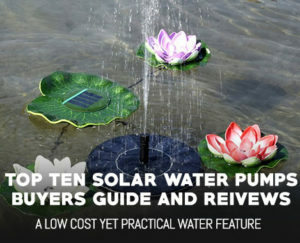 While it is a bit higher priced than some other options on our list, it’s well worth the cost. You’ll receive a unit that is made from 304 stainless steel both inside and out, a rarity among even high end units. Not only that, but it’s also got a practical towel bar handle which is not only useful for hanging items, but makes opening the door much easier. Inside, a digital LED control panel and temperature probe let you precisely dial in the temperature. We were extremely impressed with the 23-68 degree temperature range. Going that low is nearly unheard of in the outdoor refrigerator market. Typically you’d need an outdoor freezer to reach those lower temperatures. However, if you’re in a hot environment it’ll be hard to actually achieve such a chilly interior. The Bull 13700 also has a built in auto defrost feature to keep the unit free of ice and condensation. This is particularity useful for hot and humid environments which are conducive to frost buildup. Another great feature is the highly adjustable shelving. With twenty distinct shelving heights it’s possible to set this up in nearly any configuration. Three traditional wire shelves are included, but you’ll also receive a glass shelf for added appeal. We do want to mention that the glass shelf cannot be adjusted and must go in the bottom of the unit. The Bull 13700 also has a built in temperature and door alarm. This is perfect for when the door doesn’t fully close or you may have put too hot of a dish inside. In general it’ll help to conserve energy and stop you from placing items inside that might cause condensation. We were also pleased to see that this unit is ETL, DOE and CE certified for energy savings. This is a big deal, as over time the operating cost of an outdoor refrigeration can easily add up. This unit features a self closing door with enhanced seals for added insulation. It’s also got front venting internal and external fans for improved cooling and long lasting performance. Another item to note is the fully reversible door. You can easily take it off, swap it around and have it open from left to right or right to left. This is great in case it opens in an inconvenient area. 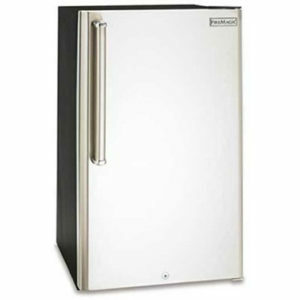 Overall, the Bull 13700 Outdoor Refrigerator is a top tier choice with a great feature set. It is a bit on the expensive side, but you’re getting a ton of value for the price. No other option on our list has quite as much packed into a single unit. Plus, when it comes to outdoor kitchens, you want appliances that can perform and last in even extreme conditions. This one most certainly can. Cubic Feet: 5.12 cu. ft.
With a sleek, all black body and stainless steel door, the Vinotemp Outdoor Refrigerator is a seriously good looking appliance. When you consider all the additional features it has, it’s easy to see why this unit made the cut. From the internal digital control panel to the blue LED strip lighting, there is nothing but high quality components and robust hardware. Starting on the outside, the Vinotemp has a front vented exhaust system for either built-in or freestanding installation. This allow you the versatility to choose based on your specific outdoor kitchen design. You’ll also find a factory installed door lock to keep after hours thieves at bay. We were quite impressed with the overall look of the unit as well. The stainless steel door goes very well with the black body and give it a unique, high end look. The door also houses a recessed handle for a seamless front finish that’s easy on the eyes. Inside you’ll find the Vinotemp Outdoor Refrigerator sports 5.12 cubic feet of space. Four shelves line the interior to provide maximum storage capabilities. Each has the choice of seven different mounting positions so you can get the shelves right were you want them. This outdoor fridge functions perfectly as a beverage cooler and can easily be the star of any BBQ. An integrated control panel graces the top interior of the unit and allows for quick and easy temperature adjustment. Just click the buttons and you can adjust the temperature anywhere from 34 to 43 degrees for a wide range of applications. The bottom of the unit is home to four leveling feet for simple installation. Just turn them one way or the other and you can have your outdoor refrigerator level in no time. One thing we would have liked to see on this unit are included door shelves. These give larger fridges just a little big of extra space, but even without them, the Vinotemp is a great value. Overall, it’s hard to beat the professional luxury look of this unit as well as the stellar performance. For folks who prefer a modern, seamless look, this is sure to be an excellent choice. Cubic Feet: 3.24 cu. ft.
As an ultra modern, professional looking unit, the EdgeStar OBR900SS Outdoor Beverage Refrigerator is truly a sight to behold. Its got triple pane glass for superior insulation while still having a that sporty open exterior. Not only that, but it’s fully surrounded in durable 304 stainless steel making it rugged enough for outdoor use. On the outside, the EdgeStar has left little that can be improved on. It’s got a full soft touch control panel that can adjust the internal temperature from 35-64 degrees with a single click. Plus, it has a gorgeous and easy to use full length door handle. This helps to eliminate bending and makes opening the door a very simple task. You’ll also find that as a built-in unit it’s got a forced front ventilation fan system for superior performance in confined spaces. Inside there are four easy to positions wire shelves that can hold an incredible 84 cans or 28 wine bottle depending on your drink of choice. You’ll have the option of six different height slots if you want to combine the two or remove a few shelves for larger items. Related: Pairs wonderfully with an Outdoor Daybed for drinks and relaxation. We do want to mention one rather large point though, this unit is not UL rated. What that means is it has not gotten official certification for outdoor use. However, the manufactures claims that this is indeed an outdoor unit and perfect for either freestanding or built in applications. To us this means two things. The first is a much lower price tag, something this outdoor refrigerator certainly has. The second is you should probably use this in a covered area that is mostly protected from the elements. However if you’re a bit braver than us you can go for a full open air configuration as it does come with a 1 year warranty in case anything bad happens. Overall this is an incredibly low priced outdoor refrigerator and would make an excellent outdoor kitchen addition. 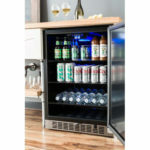 It’s also one of the few beverage refrigerators on our list that’s got a complete glass front which can display your craft beer or wine collection with ease. If you’re in the market for a low cost option that’s not terribly large, the EdgeStar OBR900SS is a well reviewed model. Cubic Feet: 5.49 cu. ft. Looking for a bit more storage space and an added cool factor for your outdoor kitchen? The EdgeStar CBR1501SSOD Outdoor Beverage Cooler is an upgrade that’ll take your space to the next level. With the ability to store an impressive 142 cans and rocking 5.49 cubic feet of space it’s got everything you need and more. The first thing you’ll notice with this gorgeous outdoor refrigerator is the stunning stainless steel exterior. It’s fully coated and is extremely resistant to rust and weather conditions. Plus, it looks wonderful, especially when paired with other stainless steel appliances. There is also a handy door lock positioned near the bottom for a bit of added security and peace of mind. Speaking of the door, it’s fully reversible for any setup and is easy to open with the large stainless steel handle. Under the front lip you’ll see the unique front vented design making it an ideal built-in unit. Plus this allows it to have a generous amount of airflow for a powerful compressor based cooling solution. The built in digital control panel paired with the compressor allow for a temperature range between 38 and 50 degrees. This is ideal for outdoor applications and will keep your drinks cool and your guests happy. Inside you can see the EdgeStar CBR1501SSOD comes standard with three glass shelves for a high end look. These are surrounded by soft blue glowing LEDs that give it some serious cool factor points. Not only that but the shelves are fully adjustable and have six different positions for maximum customization. The internal fan is linked to a high quality carbon filter which eliminates nasty odors and bacteria causing debris. We’re also pleased to note that this is a fully UL certified unit and can be placed in any outdoor location. Overall this is a stunning unit that is priced to sell. Along with the other features we’ve already mentioned, its got an auto defrost function for humid envioronments. This is super handy to have and can save you a lot of trouble down the line. If you’re looking for a mid tier unit that has high end features and incredible build quality, the EdgeStar CBR1501SSOD outdoor refrigerator should be near the top of your list. Cubic Feet: 5.2 cu. ft.
As a brand name unit that is both costly and well reviewed, you can expect great things from the Blaze Blz-Ssrf-50D Outdoor Refrigerator. Right off the bat you can see what makes it such a premium unit. It’s got solid stainless steel cladding, well built hardware and a look that just screams luxury. To top it off it’s got all the control, LED’s and certifications you could ever want to see. With a spacious 5.2 cubic foot interior and four adjustable chrome shelves the Blase Blz-Ssrf-50D looks as good on the inside as it does on the out. Each of the wire shelves is capable of hold a large number of cans or bottle for any outdoor party. Plus, the interior is lit with glowing blue LED’s for that cool, modern feel. You’ll also find an interior fan that increases circulation and promotes even cooling throughout the unit. The digital control panel located on top of the fridge is ideally placed. It lets you fiddle with the setting to your heart’s content without having to worry about opening the door. Plus, this unit has a built in auto defrost function to reduce freezer burn and prevent frost build up, both very important factors for an exterior unit. Even more, this unit, as you would expect, is fully UL certified and purpose built for the outdoors. It’s got fully sealed doors, protected electronics and and leak proof design for incredible, long lasting performance. While this might not be the cheapest option out there, you’re certainly getting what you paid for. On top of everything else that we mentioned, the Blaze Blz-Ssrf-50D Outdoor refrigerator also has a fully reversible door that is easy to flip and easy to use. If you simply want a top of the line unit, that will last for years, this is the one to get. After all, quality does indeed cost. While not quote a versatile as built-in outdoor refrigerators, freestanding options are typically a tad cheaper and look great even when not in a cabinet. Plus, they offer many of the same great features and are wonderful additions to any outdoor living space such as a garage or patio. If you’ve always wanted some easy to reach cool drinks, but didn’t want a full outdoor kitchen, these might be well worth considering. Cubic Feet: 4.2 cu. ft. The Fire Magic 3590-dr is rated as our number one best freestanding outdoor refrigerator. With a fairly low price tag, quality materials and a ton of visual appeal, it’s easy to see why. From the stainless steel door to the sleek black body, this unit is simply stunning. While it isn’t quite as versatile as our built-in options it can still easily hold it’s own. Weighting in at 120 pounds the Fire Magic outdoor fridge is fully insulated and can keep cool in even the brutal Texas heat. You’ll also find the interior is lined with an antimicrobial plastic that is resistant to mold and fungus for superior performance. Two slid out glass shelves and a single flip shelf round on the interior and make for a simple, user friendly experience. This unit is perfect for those who like to mix and match whats in their fridge. A set of internal LED’s provide ambient lighting for evening events. The exterior door is covered in 304 stainless steel for enhanced rust resistance and insulation. It features a factory installed door lock that is out of the way and won’t detract from the look of the unit. Unlike built-in units, there is not need for a front vent and the door stretches from top to bottom. This provides a wonderful seamless look that is perfect for high end outdoor entertainment spaces. Plus, the door is very well built with heavy duty handles, radial corners to prevent injuries and a mirror like finish. The manufacturer recommends you place the 4.2 cubic foot Fire Magic Outdoor Refrigerator in an enclosed space for maximum protection. If you choose to go that route you’ll need to have at least a 1″ gap on all sides to facilitate airflow. If you choose to install this open to the elements you might run into a few problems over time. When it comes to outdoor appliances it’s better to ere on the side of caution. Overall, this is a top notch freestanding outdoor refrigerator. If you’re looking for a lower cost option or have a specific look in mind, this might be the one for you. Plus, with the enhanced safety features, door locks and a robust size, little hands will have trouble, getting into trouble. In general though, we’d still recommend you look at a few built-in refrigerators before making your decision as they are a more traditional choice for outdoor kitchens. Cubic Feet: 4.8 cu. ft. The RCS Gas Grills Outdoor Refrigerator is by far the lowest priced option on our list. As such you should temper your expectations when it comes to build quality and overall performance accordingly. With that being said however it is still a rock solid unit that if taken care of, should work wonderfully for years to come. Inside it has a sizable 4.8 cubic feet of space and is designed for medium and large sized outdoor spaces. The interior light and adjustable shelving give it that high end feel even though the unit is a fraction of the cost. Two inner drawers provide extra storage space and are great for separating various items. Meanwhile the interior glass shelves are perfect for cans, bottles and more. When it comes to storage and interior space, the RCS Outdoor Refrigerator has got you covered. An internal adjustable thermostat is also included which allows easy and convenient temperature changes. Not only that but it includes an automatic defrost function for added value. This is rather important because users have found this unit tends to ice up over time and does need occasional defrosting. Most of the higher end units do not, but again, you’re getting what you pay for. If something does happen to the unit though, you can rest assured you’ll be covered as it comes standard with a 1 year warranty. The front door is made from high quality stainless steel with a black plastic trim. This not only provides an excellent look but does a great job of keeping the costs down. The RCS Outdoor Refrigerator also forgoes a dedicated handle and instead opts for a recessed area of the door. You’ll also find that the unit has adjustable feet and levelers for uneven surfaces. These are perfect for outdoor kitchens as even the most level patio slab will have a little bit of play in it. We also want to note that the door is fully reversible and can be used in either left or right side configurations. Overall, this is a budget outdoor refrigerator that while not amazing, will get the job done. It’s perfect for a starter outdoor kitchen or for those who don’t want to spend quite as much money. It’ll keep your drinks icy cold and provide a great element for your exterior space. If you can manage a few hundred dollars more though, we’d highly recommend you go with one of the more expensive options. Not only will it perform better in outdoor conditions, it will last longer as well. In general, an outdoor refrigerator is one of the best appliance to add to an outdoor kitchen. Aside from a sink and a grill they provide more value and functionality than any other piece of equipment. 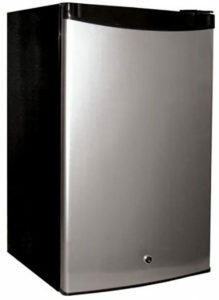 Plus, a great outdoor refrigerator is extremely versatile depending on your needs and works in nearly any environment. While they may not be the cheapest of items to purchase, if you get a high quality model, it should last for a very, very long time. 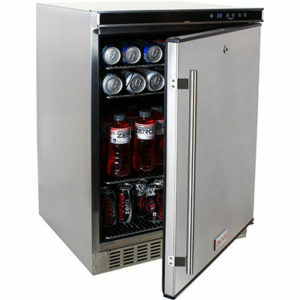 If your looking the best outdoor refrigerator, just go ahead and Buy the Summit SPR627OS. It is easily the best choice on our list and is the perfect blend of cost, performance and durability. Now that you’ve got your outdoor refrigerator on lock down, you might also be interested in adding a few water features to your backyard. 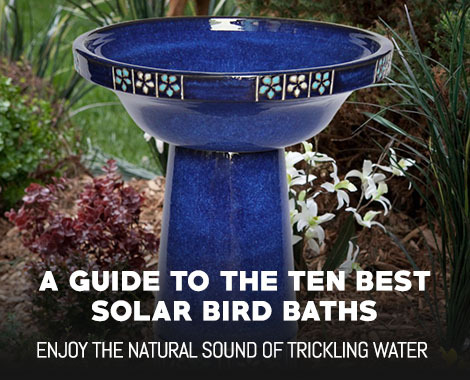 We’d recommend either a solar bird bath or a solar pond pump for an easy to install option.